Jack Kirby is a legendary comic book artist. He is the mutual idol of TMNTcreators Kevin Eastman and Peter Laird. Born on August 28, 1917, Jack Kirby is best known for his work on the art of the early Fantastic Four comic books from Marvel Comics. Soon after, he began work on several other comic lines from Marvel, such as The Avengers, the original X-Men line, Hulk, and many, many others. Unfortuneately, he became dissatisfied with working with Marvel, and joinedMarvel’s main rival: DC Comics. There, he could be more creative with his art, and create some stories of his own. He mixed previously created lines, such asSuperman, with his own lines to form a storyline spanning almost all DC titles. He soon returned to Marvel, though was treated improperly and was not given his full pay, among other employment benefits. He left Marvel and began working with animation. He died February 6, 1994. Kirby appears in Donatello #1. He is first seen in his office space drawing a fly creature with his pencil as Donatellopeaks through the door. The fly creature Kirby just drew startles Donatello which in turn startles Kirby. Kirby is surprised since he didn’t remember drawing him and comes to the conclusion that he must be real. He assumes Donatello has come for the crystal and defends that he was only borrowing it for a while. Donatello assures Kirby that he is a friend and questions him about how he made those drawings come to life. Kirby tells him that it was the crystal on his pencil that supplies the “magic”. He explains that he had found the crystal by accident a few months ago and discovered what it could do. He then shows Donatello a doorway he had drawn that didn’t go away, unlike the rest of his drawings. 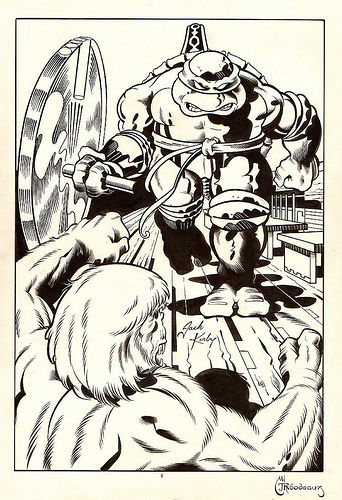 Donatello steps through the doorway, and tells Kirby that he must see what’s on the other side. In this world, Kirby found an odd-looking gem in a coal pile and attached it to his pencil. After doing this, everything he drew came to life temporarily, except a portal-like device. When Donatello found Kirby when helping his brother Raphael turn the water temperature hotter, they went through the portal, and found that everything he had drawn since putting the crystal on the pencil had become a world. The villains he had drawn were overunning a city, and Donatello and Kirby managed to defeat all the villains. There was only enough time for one of them to get back through the portal, and Jack forced Donatello back through the portal. Jack had enough time to send a note to Donatello through the portal, however. He appears in the episode The King, and refers to himelf only as “Kirby”.